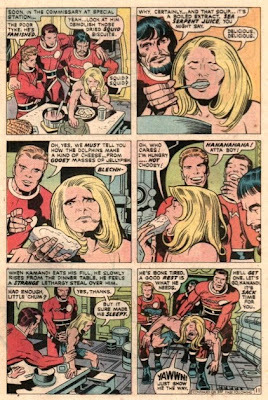 Kamandi, the Last Boy on Earth, would like to wish everyone in the United States a very traditional, utterly conventional, and totally unremarkable Thanksgiving dinner. And should this be the case, Kamandi would very much like to spend Thanksgiving with you instead of the mutants next year. The following was written at the behest of pillock, who asked to see it, in connection with Andrew Hickey's revisionist Pop-Drama Manifesto. This piece also combines elements from two of my favorite films. In 1890, the British Colonial Office dispatches a young nobleman and former Army officer named John Clayton, Lord Greystoke, to investigate reports of forced labor conscription of natives by a rival colonial power. Clayton departs for Africa with his bride of three months, the former Alice Rutherford, intending that they present themselves as wealthy idlers whose family owned a rubber plantation there before the colony changed hands in 84. The couple never reach their destination. Following a mutiny aboard their ship out of Sierra Leone, Lord and Lady Greystoke are put ashore at a remote spot on the coast. Rather than following the coastline, the couple head inland in hopes of reaching a Christian mission, because the pregnant Alice urgently needs medical attention. The mutinous ship is attacked and sunk before its crew can reveal the Claytons were spared rather than killed in the mutiny, so a search never takes place. Husband and wife are never seen again. The following year, heir presumptive to the Greystoke estate William Clayton mounts an expedition to learn the fate of his long-lost Uncle John and Aunt Alice. Joining this expedition is Professor A.Q. Porter of Baltimore, with Porter's sixteen year old daughter Jane serving as caretaker and factotum to her naturalist father. Finding no trace of the Claytons on the coast, the party moves inland. Very much further inland, they find a secluded village. Among the villagers they're stunned to see a twelve year old boy, in all respects a normal member of his tribe…except for his distinctly Caucasian skin color. The boy is nearly as surprised: he's never seen any albinos other than himself before, but now several show up all at once! Through their interpreter, Clayton and Porter hear an outlandish story of hunters from the village discovering a female gorilla trying to nurse a hungry newborn human baby. Bringing the infant back to their village, one of the hunters and his wife raised the boy as their own. Going by the child's apparent age, William Clayton works out what anyone would at this point: Alice apparently gave birth to a child in the jungle. This boy may well be William's cousin, the true heir to the Greystoke estate. The interpreter explains to the villagers that William is the son of the brother of the boy's father, and wishes to bring the boy to his family home. As soon as the boy hears this, he flees into the jungle. The albinos want to buy him from his family? He won't go! The expedition tries to lure him back, but he stays hidden. Finally, after much effort, they're obliged to give up and leave. As they make the long journey back to the coast, the expedition are aware of the boy tracking them the whole way. They continue trying to coax the boy, but they've misunderstood his motives. He's not watching them leave with ambivalence: he just wants to make sure with his own eyes that they're gone and won't come back. Sometime around 1906, a scruffy vagrant youth is spotted in fishing towns and shipping ports along the coast. He's sometimes dubbed "the white savage" and sometimes other, less benign names. Over the next couple of years, he picks up bits of spoken German and English and French and Dutch from sailors, though he remains illiterate. The boy watches black workers driven past the point of collapse by white bosses, as their forced labor builds railroad lines connecting the ports to the plantations of the interior. Finally he hops aboard a steamer heading across the Atlantic, working his passage as a deckhand. On the crossing to America, the boy becomes the responsibility of Julius, an old merchant sailor. Julius outfits the boy with an old Navy coat for the approaching cold weather. It's the first winter coat the boy has ever worn. He's overawed. Seeing the boy parade back and forth in his big coat with the brass buttons, admiring its finery, Julius mutters an affectionate insult in Hebrew -- "tarzan," which means a dandy or a toff. From then on, "Tarzan" becomes the boy's nickname aboard ship. Apart from his new coat, Tarzan has only one other possession. He keeps it hidden away, but pulls it out to examine when no one else is watching. It's a piece of paper given to him by the ugly albino girl during her well-intended but futile attempt at teaching him to read. Although he still can't read, Tarzan knows -- because the ugly girl told him so -- this slip of paper holds the location of the ugly girl's home. And she can tell him where he came from. John Clayton, the Viscount Greystoke, and his wife Jane arrive in New York City at the start of the Roaring Twenties. The Jazz Age. Art Deco. Prohibition. Speakeasies. Bootleggers. Gangsters. Babe Ruth playing for the Yankees. The music of Coleman Hawkins, Louis Armstrong, Duke Ellington, Jelly Roll Morton, and Bessie Smith. Clayton loves the towering buildings and the lights and the sights and the sounds. It's like he can see the future being assembled before his eyes. The Claytons are hailed as celebrities. At age 21, John Clayton -- not yet granted his inheritance and needing some quick cash -- sold the story of his African childhood to a writer in Chicago. The tale became a magazine serial and then a series of popular books. The arrival in New York of a titled young English nobleman with money would be exciting enough; the arrival of the real-life Tarzan is an absolute sensation. When Benjamin Franklin was the American Ambassador to France, he affected shabby clothes, a fur cap, and a folksy demeanor. The French ate it up. Playing to their lowest stereotype of a simple country bumpkin, Franklin conned the pants off the French aristocracy. John Clayton does something similar, playing at being "Tarzan the jungle man" for the crowd while leading a refined upper class lifestyle. He's the urbane and debonair "natural primitive" in fine tailored suits. His looks and charm make Clayton a hit in society. But inwardly he's seething. The book based on his childhood left out his adoptive family and his entire village in favor of claiming that he was raised by apes, because readers would more readily accept a human raised by apes than a white boy raised by blacks. Raised by apes! The sequels were spun from whole cloth: Clayton is sickened to hear of his fictional alter ego becoming the king of "savage black cannibals" who he calls "my children." The racism of the sailors and bosses he saw in the port towns as a boy barely prepared John Clayton for what he's seen since then. Lynchings. Race riots. Cross burnings. Men in white hoods. The persecution of immigrants and trade unionists in the Red Scare. Perhaps Julius could have explained it, but Julius was killed by a lynch mob in 1915 while traveling through the South. Jane Clayton shares her husband's views. The Porter family had been abolitionists and freethinkers, and Jane's mother a suffragist. Jane no longer seems ugly to John. Now that John has finally come into his long-delayed inheritance, the couple move to New York City to advance their hidden social agenda. In August of 1920, John Clayton is among the audience of 25 thousand seeing Marcus Garvey at Madison Square Garden. Some alongside Clayton in the audience know him only as the racist Tarzan of the books, and don't know what to make of his presence at the rally. Neither does John Hoover of the government's Bureau of Investigation, whose agent spots Clayton there while keeping watch on Garvey. Clayton is vexed when Garvey has himself named "the Provisional President of Africa" but nonetheless is deeply moved by the rhetoric, and shares Garvey's rage at the current state of things. The wealthy white nobleman is a black nationalist, ardent anticolonialist, and clandestine backer of African native uprisings. He's a foe of Gandhi for his support of the British against the Zulus in the Bambatha Rebellion. Spied on by Hoover. Pursued by Garvey. He wouldn't use guns, but he's no stranger to hunting with knife and spear. In his exploits, Tarzan becomes the nemesis of rumrunners and racketeers and slumlords and feds alike.